Given how long I have been away for (more than a month now…) I might as well start a new blog, introduce myself and all that. Seriously, I came back from Pune, now almost three weeks, all geared up to show what I have been making and all that, but now that was more than three weeks ago. And what took me so long to write? Well, the sad and the very tedious reason is that we had no internet. So. Anyway. Here I am, dear friends. If you have checked in a few times to see thank you for your patience. There is no revised or new version of me or anything, nor any profound reason for why I was away for so long. But thank you for dropping by. It feels like too long ago, to tell all that I have been making and doing the last many weeks. But let me just start by saying that someone around here turned five a few weeks ago. While this happened only a little over two weeks we feel like it happened a long time ago, because the person is no longer constantly reminding us excitedly that she has “just turned five.” By now we take this fact for granted, and are almost looking forward to being five and half. As a birthday present she got something very small, but something that she had wanted for a while. Two clips! 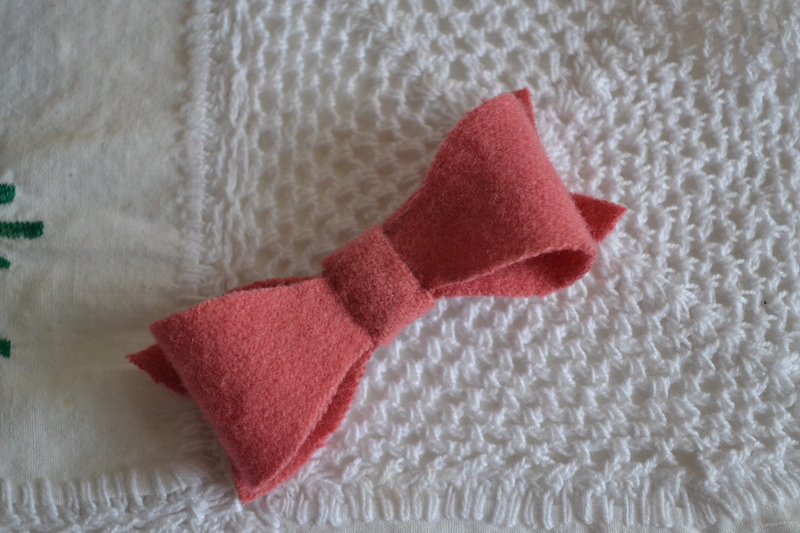 The pink bow clip is a free pattern from here and was super simple to make. I didn’t do a great job with the hot glue gun but that’s ok as she nor anyone can see it. 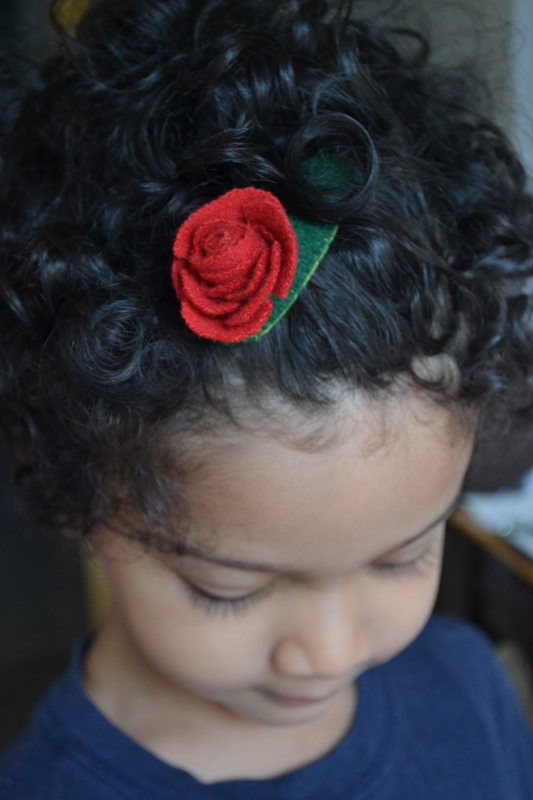 The rose barrette is from here and took some fiddling but was worth the time and effort. 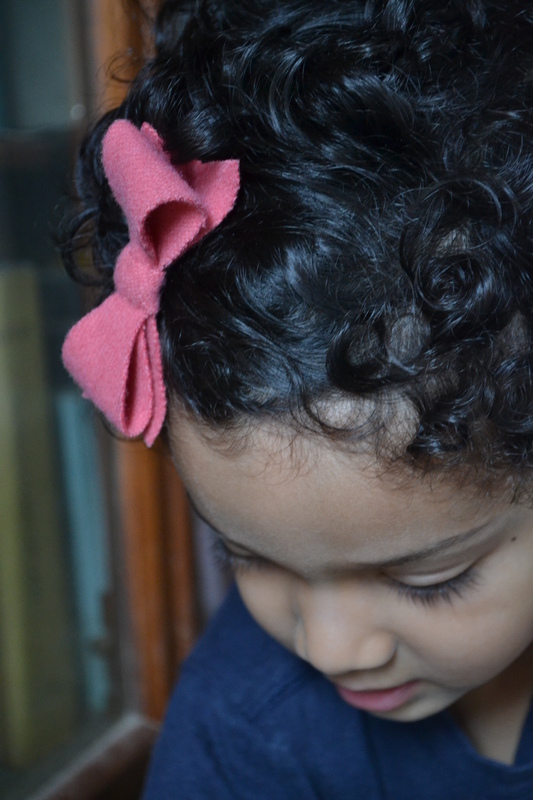 N wore the barrette for her birthday and has been happily using both since. The weather in Delhi could not have been more different than in Pune. But no more “weather” talk because the only way for me to deal with Delhi is to not talk of the weather at all. So anyway, the good thing was that we came back and I realised that she just needed very very light clothing rather than any birthday-appropriate fancy frocks, or fancy anything for that matter. And birthday or no birthday, she needed some pajamas. So one got done last week. (Apologies for the not so nice looking shirt in the picture. Its from when some artwork got done…). And here is one of the lovely toes with what I call the remains-of-the-summer-vacation nail polish. 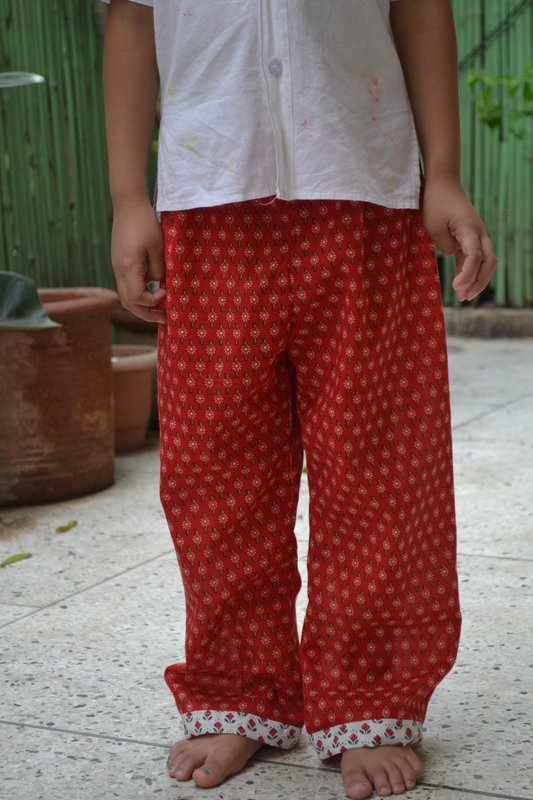 The pattern is from here and they are called “sleepover pajamas.” (I only made the bottoms.) 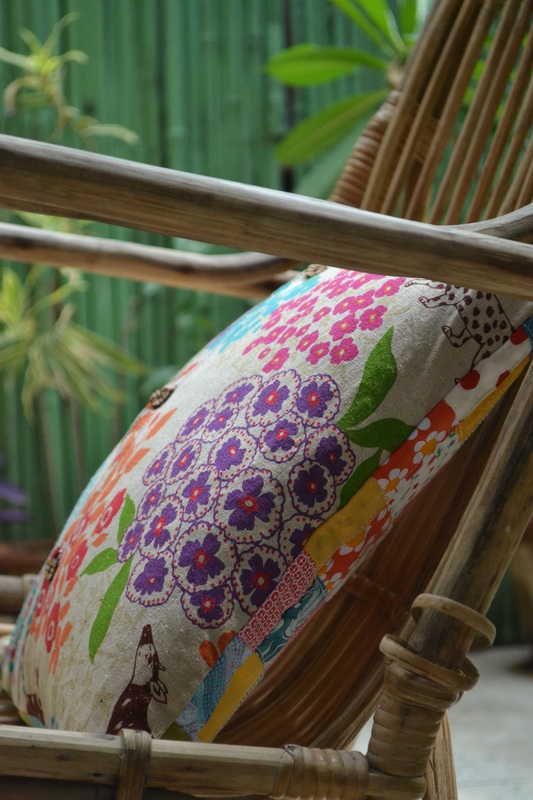 The fabric is very thin cotton from my favourite shop in Pune. 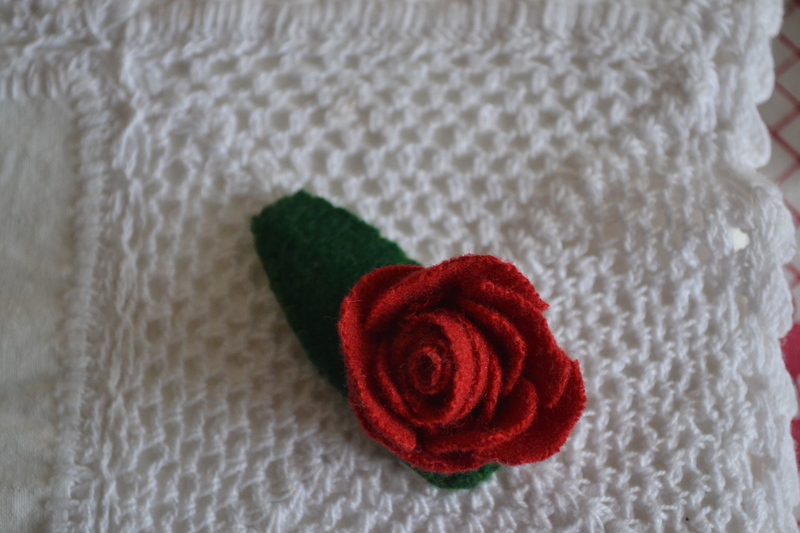 It’s the first thing I have made for her in size 5, and while they are a wee bit long, she loves them. Cutting them and then making them I also felt a bit sad and like suddenly she had grown. I would like to say that I just finished making them in under an hour or something, because it is actually possible to do that especially with the no ruffle version. But no, they took very very long, in part because I cut only one cuff per leg and could not, for the life of me, figure out the instructions. I entirely blame this matter on the fogginess in my head induced by humidity, but, as I said….no weather complaints. So that’s why they look like bedtime story pajamas, but just for the record, they are not meant to be. I have to more on my sewing table and plans to make amends. The other thing that got done in this no internet period is this. 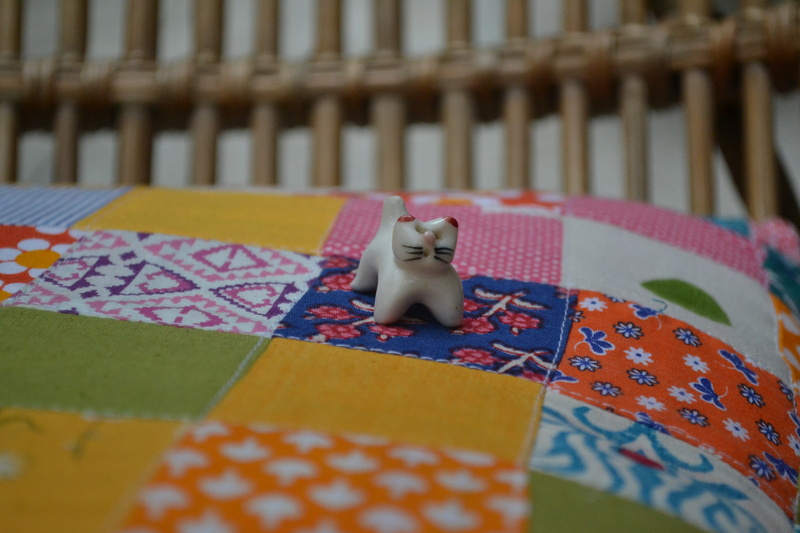 I have been cutting up and saving the 2.5″ squares for sometime now to make this. The plan was to do it in Pune, and I even took the squares there, but then I already told you lazy I was in Pune right? So I got them back here. 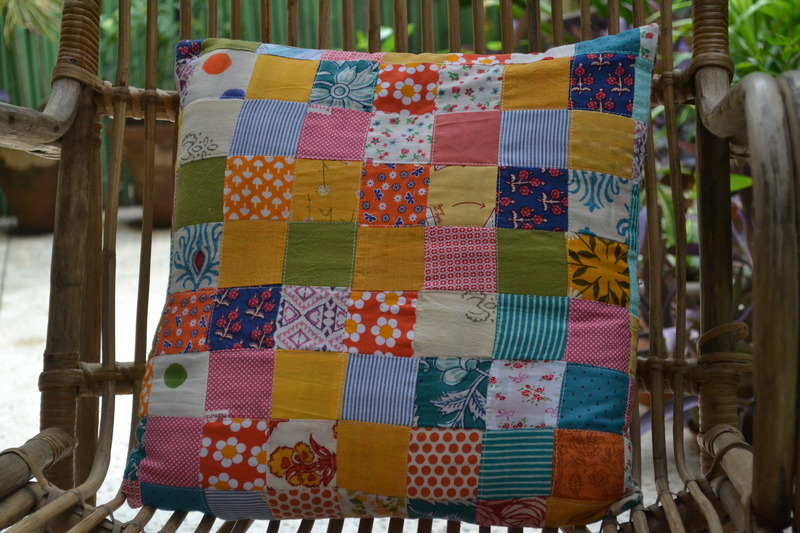 I have been trying not to save too many scraps of what is left over of the fabric after I cut it for something else like a dress, and so this little pillow was perfect. It has lots of remaindered fabric that got left back. And reminders too of what got made this last couple of months. N loves the pillow cover to see if she can remember what was made with what fabric and it has now become a kind of a game. I wanted something nice for the back so that we can use both sides. So I used a remaining bit of Echino and did a simple button closure. As you can see the little cat likes it too! See you all soon. Thank you for visiting.